I’ve never studied linguistics, but I’ve noticed there are some subtleties in words and language that I need to pay attention to in personal life, business, and of course in the puppy training world. This became very apparent when I first learned the difference between a command vs cue. At first glance the two words seem very similar, but in fact they are very different. 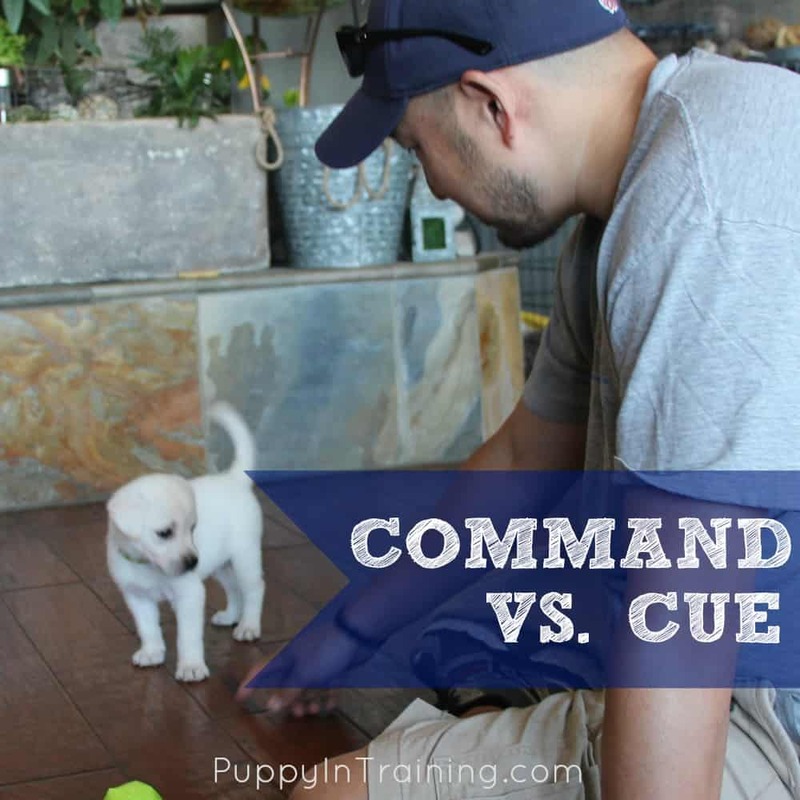 So, was the term cue basically the same thing as a command and just the dog training industry moving on to new terminology? How Are We Training Archer? Now that we know the difference between a command and a cue what are we teaching Archer? Do we give him commands or cues? I had a plan for Archer. His breeder started clicker training him from day one. My goal was to extend what Archer had already learned and continue clicker training him. I had a remedial background in clicker training after attending service dog training classes with Tender Loving Canine Assistance Dogs (TLCAD), reading Karen Pryor’s Don’t Shoot The Dog, and other clicker training publications, but I had very little practical training. Yes, I had worked with some of the service dogs at TLCAD and yes, I had worked at home with my personal dogs: Stetson, Linus, and Raven. However, I wanted more guidance and that’s where Wags and Wiggles Training For Life (TFL) program came into play. “…Our goal is for every human and dog to achieve the best relationship possible. We strongly believe in giving the human and dog end of the leash positive feedback during learning. We use a combination of food, praise, toys, real life rewards and clicker training. Back to the questions at hand: How are we training Archer? Are we giving him commands or cues? We train Archer by giving him cues not commands. Clicker training is a different type of training then some of the aversive methods we learned as Guide Dogs of America (GDA) puppy raisers. I’m not going to say it’s better or worse it’s just different. I may be tooting a different horn this time next year, but for now I’m a clicker training noob and need to immerse myself in the clicker training world before coming to meaningful conclusions about which methods might be best for my puppies. As always I preach patience, persistence, and consistency no matter how you decide to train your puppy. How about you guys? 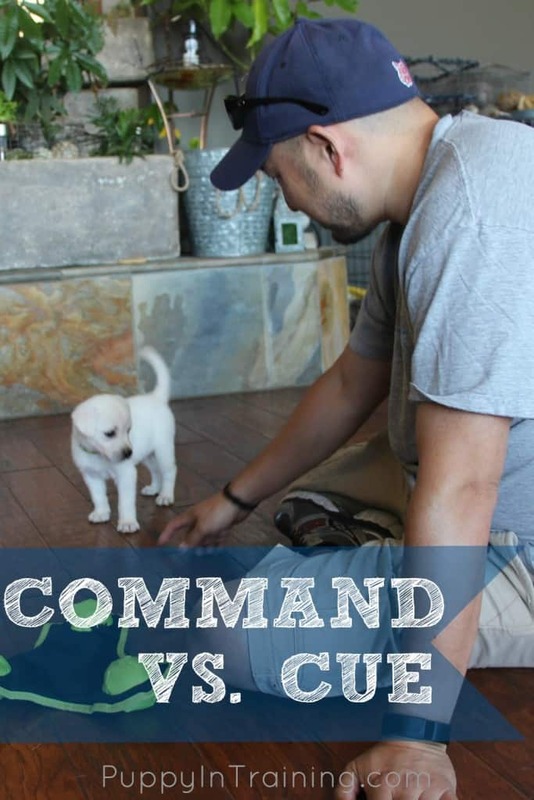 Command vs Cue…which do you use with your puppy? Tell us all about how you train your puppy in the comment section below. This something very interesting thing to find today. Command vs Cue something totally different from each other. Learned here that these are opposite to each other. and the dog would also not be threat against us. we train our dogs, with the help of these commands by our self. Thanks for the important share. Command says the dog must do what you say. Cue means the dog does what you say if he decides, at that moment, that the reward you give is worth it. Chicken or squirrel chase? So I ask you, who do you want to be in charge, you or your dog? Treats are great for teaching new behavior, but once learned, the dog needs to do what you say, just because you are in charge.